Habitat for Humanity building committee members at work on Saturday morning. On one of my bike routes through Albany’s neighborhoods, I could not help but notice building activity on Front Avenue along with a sign announcing that something special was going on. What’s happening at 2234 Front Ave. N.E. is that Habitat for Humanity is building a house, but not just any house. This one goes beyond the routine requirements for ADA compliance. Intended for two brothers who are disabled, the house will meet more exacting requirements such as special kitchen and bathroom designs and an easy outside entry. Instead of contributing 500 hours of “sweat equity” labor to the building of their house, as usually required under the Habitat system, the brothers have done their 500 hours by working at the Habitat for Humanity Restore. 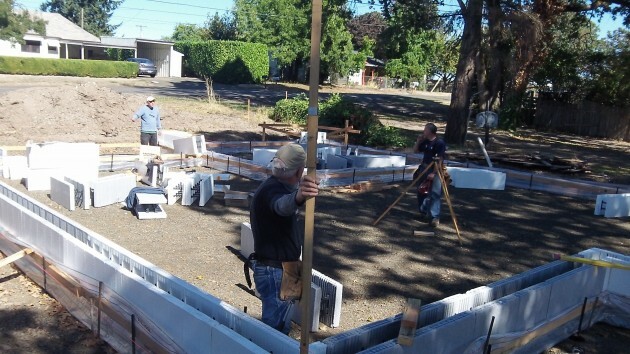 On Saturday, three members of the Habitat building committee were working on the forms for the foundation of the 1,150-square-foot, three-bedroom and two-bath house. They were getting ready for a concrete pour using new technology they hope will reduce the foundation expense as much as 25 percent. The savings are significant “when you build a house on donations of labor, cash and supplies,” said one of the three, Bill Riley, who was working on the site along with Chuck Dallenbach and Jerry O’Riordan. 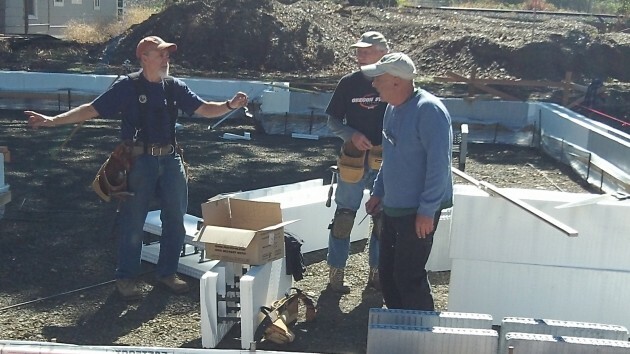 The foundation and some other parts of Habitat projects — framing and sheathing the roof and so forth — are done by expert builders, and licensed craftsmen install plumbing, electrical and heating. For less specialized work on Habitat projects, community volunteers are invited to help out. The construction site as near the east end of Front Avenue.